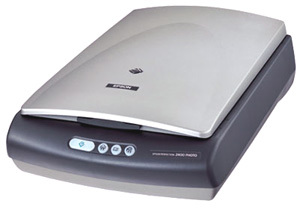 This scanner can be used on a RiscPC etc. in conjunction with either a Simtec or Castle USB Podule and also on an Iyonix. The unit is 'refurbished', all units are fully tested but may not be in the original box. The guide for slides/negatives are missing. The scanner is fully functional it will just be a little bit less convenient to scan slides or negatives than if it was present. If using a Castle USB podule please note that version 0.94 of the firmware is the only version known to be compatible. If you do not have this version, please get in touch with us and we can supply a flash update.